For authentic Italian and Spanish cuisine with a modern touch, look no further than our very own shore at MyTown Shopping Centre at Cheras. Spasso Restaurant and Bar opened in April this year at the new shopping mall located next to the new Ikea Cheras. No stranger to the dining scene, Spasso is under the umbrella of Outto Dine group who also manages other popular eateries such as Limoncello, Svago, Weissbrau, Aka Chochin and Pascucci. Spasso offers modern European cuisine set in a casual ambiance. At sight, Spasso has a smart casual ambiance set in lots of dark colours mixed with shades of wood. The restaurant is spacious and offers a nice bar as well as glimpse of the open kitchen. One can also see their wood oven in the kitchen, another plus point for pizza lovers. Spasso is helmed by Spanish Sous Chef Iker Fernández Caballero who hails from San Sebastian. With over 20 years of culinary experience in Michelin-starred restaurants and luxury hotels globally, Chef Iker is aiming to garner swine lovers’ palate by putting together a sumptuous menu filled with porky delights as well as classic Spanish tapas to go with the wine list it Spasso has. The menu is pretty solid with a good list of All-Day Breakfast, Salad or Soup, Tapas, Pizza, Pasta or Rice, Sandwich or Burger and Dessert. 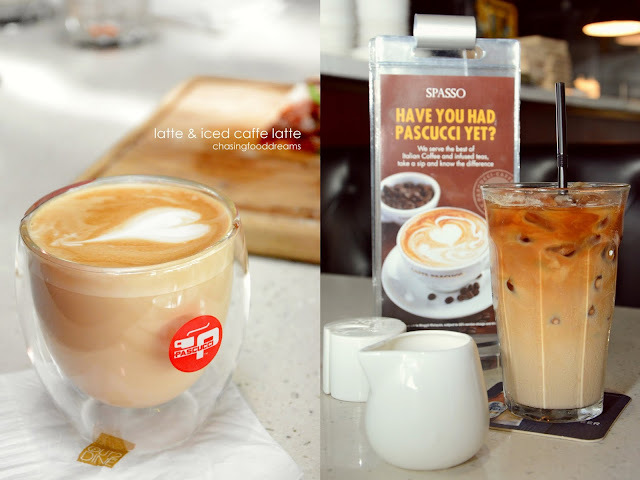 Since Outto Dine carries Pascucci coffee in their group, Spasso also serves Pascucci coffee and tea as well as a list of wines, champagnes, liqueurs as well as non-alcoholic beverages. We started our lunch with coffee. Both of our Latte (RM13) and Iced Caffe Latte (RM15) was decent with quite perfect for our palates in terms of coffee aroma and flavours. From the All-Day Breakfast list, we tried the Spanish Omelette (RM10), a potato and onion frittata that is popular in Spain. Light, fluffy and easy to enjoy, the omelette is packed with creamy soft potatoes and sweet onions. Served with side salad and toast, this dish even comes with free coffee or tea if you order this before 12noon. We opted for Spanish Salad (RM15), simply because we saw it listed with poached egg. Crisp greens paired with ratatouille, olives and tomatoes in light tangy dressing, the salad was definitely made better with that beautifully poached egg with a flowy egg yolk center and crispy potato straws. Moving on to the Tapas menu, we literally wanted to order almost everything because the list looked very enticing. Settling for Iberico Ham (RM23), it was certainly a great sharing platter when the dish was placed on our table. Gorgeous cuts of Spanish Iberico ham is served with toasted sourdough bread and a light tangy tomato sauce. The ham literally melts-in-the-mouth with a luscious salty finish. Its quality cured meat at its best! The next tapas of Garlic Prawns (RM38) already won brownie points when placed in front of us. Served in a hot stone bowl, the aroma of the sizzling prawns is tantalizing. The dish is one of our top favorites that day and is literally bursting with fireworks flavours of garlic, chili and herbs. Damn shiok, we were wishing for more toasted bread as well as another order of this succulent garlic prawns. A Must-order! The Mussel Marinara (RM16) fair decent in my book. Nothing to fault but it didn’t leave us that firework of flavours like the Garlic Prawns. It is still cooked well with each tender mussel nicely smothered with lots of tomatoey goodness and served with toasted bread. If there is one pizza to order, the Iberico Pizza (RM39) is your best bet. Beautiful thin crunchy crust smothered with deliciously flavourful tomato sauce and crowned with Iberico ham, fresh rocket leaves and generous sprinkling of parmesan cheese, it’s a pizza with classy flavours. Another dish drool-worthy is the Seafood Paella (RM56). Best for sharing, the paella is served traditionally in the paella pan and comes with generous helpings of large prawns, mussels and clams with rice cooked in saffron laced seafood broth. Rice cooked al dente and beautifully moreish in flavours, we just couldn’t resist polishing this off happily. The seafood was fresh, succulent and cooked just right, elevating the dish to much satiation. For lunch option, the Pork Secreto Sandwich (RM28) is a hearty and bulky sandwich for big eaters. Focaccia bread sandwiched with slow roasted pork loin, smoky and sweet grilled peppers, onions, tomato, lettuce and blue cheese is bound to make any foodie swoon. Comes with a side of crinkle cut fries, this is one sandwich to be taken seriously! For vegetarian option, one can opt for the Vegetable Pesto Risotto (RM28). Risotto rice cooked al dente and well flavoured with cheesy and nutty pesto sauce, there’s plenty of vegetables such as broccoli, zucchini, bell peppers, tomatoes and more to give the dish a healthy dose of greens. Spain is famous for their dessert of Crema Catalana (RM8). The version here is sublime. Utterly luscious and creamy baked custard with a thin layer of caramelized top, the Crema Catalana is the perfect sweet ending to a meal at Spasso.